Konnekt Videophone is a very simple video phone designed to work alongside any captioning telephone, turning it into a Captioning Video Phone system. It’s ideal for those who are deaf, mute, or with poor hearing or speech. It adds full two-way video to captioned phone calls, enabling you to talk face-to-face while reading text captions that display what others are saying. This allows you both to read lips, body language, and subtle signs of comprehension such as nods, eyebrow movements, head tilts and smiles. You can even talk in sign language — either directly or via a video relay / translation service. You can also use visual communication aids such as photo language cards or good old pen and paper. 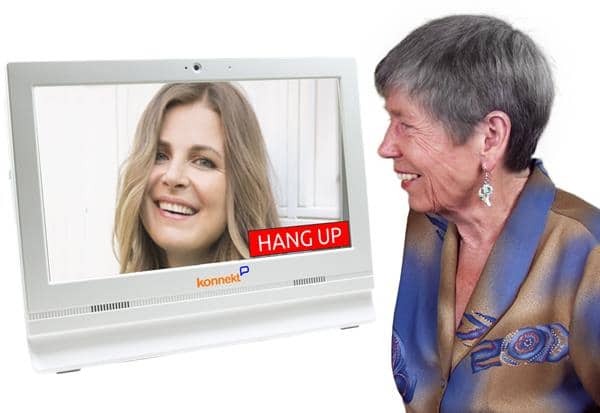 Your Konnekt Videophone communicates visually with any device that can use Skype for video-calling – such as a mobile phone, iPad/tablet or computer. Your regular captioning telephone joins in the call, giving you readable text during your conversation, in the way that you’re used to. The Konnekt Videophone recently won the ITAC award for Best Consumer Friendly Product in Aged Care. It’s ideal for those with a hearing or speech difficulty, are lonely or socially isolated, or might struggle to use a fiddly computer tablet or a complicated telephone. There are no menus or icons, no logins or passwords, no fiddly connectors, and no controls whatsoever. Videophone connects family and friends face-to-face. You can even have group calls, so you can see several relatives at the same time. People with deafness or a hearing problem – especially those aged 65 to 99 – often have feelings of loneliness. This can contribute to depression, anxiety and physical health problems. Frequent face-to-face contact with family and friends is known to reduce social isolation and is shown by research to halve the risk of depression. The Konnekt Videophone is the ideal companion to any captioning phone (such as a Captel telephone) or relay service. It gives you a cost-effective and easy-to-use captioning video phone system that enables you to SEE what’s being said while sharing a smile, observing visual communication cues and expressing yourself more fully with your face and hands. It’s the next best thing to being there! Contact us to learn how it works, or ask us about government funding.